This is a really pleasing fireplace screen design! It's a flat screen, so it will work well on any hearth, but especially if you have an older home with a shallow hearth. The eye-pleasing leaves and berried motif is hand forged, and the handles and feet offer a nostalgic rope-twist design. The feet adjust to keep the screen upright even if your hearthstones vary in height. 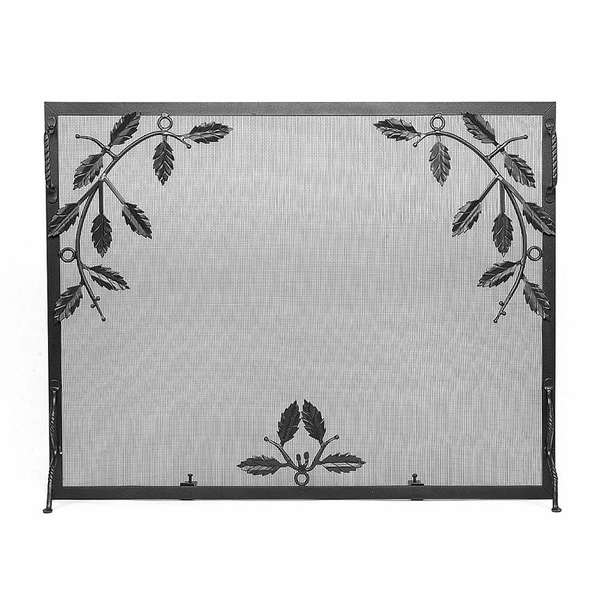 This Minuteman G-3830 Weston Fireplace Screen w/ Leaf Motif features a graphite finish and measures 38 inches by 30 inches by approximately 1/2 inch. Protect your flooring from flying sparks with this unique design! Just remodeled my family room and decided to decorate in the theme of leaves. This fireplace screen was perfect! Not overly decorated, but just enough to give it a perfect touch. When we put in a new fireplace, we hardly thought about what an investment the screen is! Prices are ridiculous! But we were very happy with this screens price, and were really happy now that we have it with how great it looks.